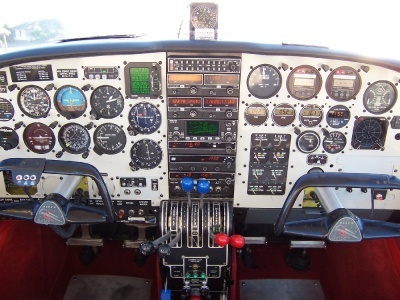 The Aztec began life as a more powerful version of the Piper Apache which itself began life as a reworked version of a twin engine Stinson design when Piper Acquired Stinson after the Second World War. The original twin Stinson featured an "H" tail but in other respects, had generally the same lay-out of the Apache. The Apache was a more refined airplane and featured feathering propellers. The original Stinson design had propellers that would not feather but instead featured a propeller brake to stop wind the milling propeller of a dead engine to reduce drag in engine-out flight conditions. Both designs were notoriously underpowered with only one engine and could be difficult for all but experienced pilots to fly under such conditions. The Apache featured Lycoming engines that produced 150-160 hp. To increase performance, Piper refined the Apache design further (the improvements were largely cosmetic) and, more importantly, added significantly more horsepower to the design. The Apache 235 featured 235 hp. Lycomings which significantly improved engine-out flying conditions. Soon thereafter, Piper introduced the Aztec, which was mostly an Apache 235 with even more powerful, 250 hp. Lycomings. It was 250 hp Aztec that would become the most popular of the lot and, as far as twin engine planes go, a good STOL and bush plane. Many Aztecs were turbocharged for even increased performance, particularly at altitude as the turbocharging system was a “normalization” system as opposed to a "boosting" system. This meant the turbochargers could be used to bring the engines up to 250 hp, regardless of altitude (up to a point), instead of boosting the engines above their original 250 hp rating. Early turbocharged versions of the Aztec featured RayJay Turbochargers and while these systems could be used to enhance altitude performance, RayJay turbos were manual, finicky, intolerant of improper operation, and difficult to maintain. While some will extol the virtues of the RayJay turbos, they are not considered to be an improvement over a non-turbo plane by many operators and pilots. Single engine Comanches, Bonanzas and Mooneys also were fitted with RayJays and all planes will occasionally show up on the used airplane market. 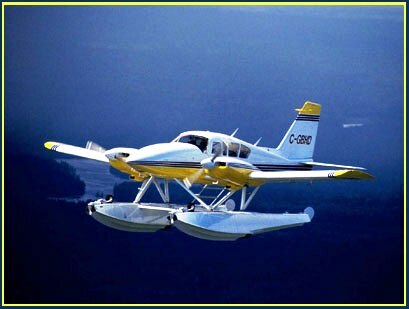 Regardless of turbocharging, the Aztec is the best light twin for bush flying out there. It features the same airfoil as the Cub and Super Cub (albeit of substantially different dimension and construction), so it is a natural STOL plane, especially when compared to similar twins such as the Beech Baron and Cessna 310. The high lift wing does come at a price though, and that price is reduced cruise speed. Aztecs will cruise around 200 mph and are easily out paced by Barons and 310s. Some turbo Aztec pilots claim cruise speeds approaching 250 mph at altitude, but unless the pilot is willing to take the Aztec very high, and put on an oxygen mask, such speeds will never be realized by the typical Aztec operator. Count on 190-200 mph all day long in the real world, turbocharged or not with the Aztec. Despite not being serious speedsters, the Aztecs had a very roomy and comfortable cabin that can seat six people. Like most light twins (and light planes in general) the furthest back two seats are a bit cramped. Aztecs have been equipped with floats, both straight and amphibious and currently, Nomad Aircraft of Ontario, Canada offers the float modification. Nomad claims a cruise speed of 135 kts. on floats for the Aztec. The modification also includes a very small pilot side door. Watch these Piper Aztecs flying and landing in formation.